Holocaust Survivors Honor Camp Liberator When Vernon Tott came upon Germany's Ahlem concentration camp in April 1945, he and fellow American liberators were unprepared for the horrific scene they found. Fourth of a five-part series. 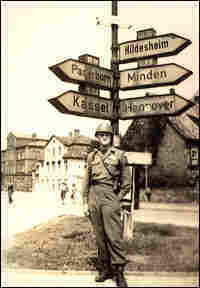 Infantryman Vernon Tott, in an undated photo from World War II. 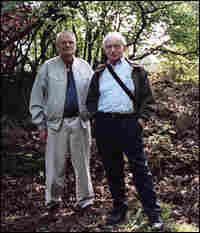 Liberator Vernon Tott (left) and Holocaust survivor Ben Sieradzki visit the site of the Ahlem concentration camp near Hanover, Germany, in 2004. 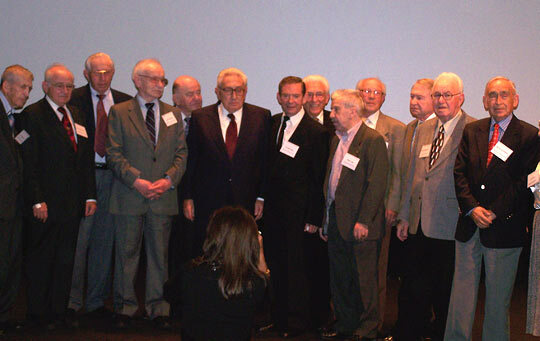 In May 2007, former Secretary of State Henry Kissinger spoke at New York City's Lincoln Center at the premier of Angel of Ahlem, a documentary about Vernon Tott. Kissinger, who served with the 84th Infantry Division, described what he saw during the 1945 liberation of the Ahlem concentration camp outside Hanover, Germany. "It was the single most shocking experience I have ever had," he said. 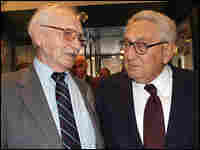 Ahlem survivor Ben Sieradzki (left) and Henry Kissinger attend the Lincoln Center showing of the documentary Angel of Ahlem, about Vernon Tott. Ahlem survivors attended the Lincoln Center showing of the documentary, which was introduced by former Secretary of State Henry Kissinger. From left, Abe Bekermus, Roman Kent (survivor, not from Ahlem), Henry Shery, Ben Sieradzki, Jack Tramiel, Kissinger, Sol Bekermus, Ben Berkenwald, Henry Pius, Jack Jacobs, Abe Stern, Chaim Melamed and Charles Swietarski. World War II has been explored in countless classrooms, books and movies. So, it seems incredible that, decades later, stories from that war can still surprise us. As Ken Burns' documentary series The War debuts on PBS, NPR explores a handful of stories from World War II that haven't been widely told. Vernon Tott quit high school and snuck into the military so he could fight for his country. Like many soldiers, Tott learned to accept the realities of war. His 84th Infantry Division fought in the Battle of the Bulge and lost a third of its troops. 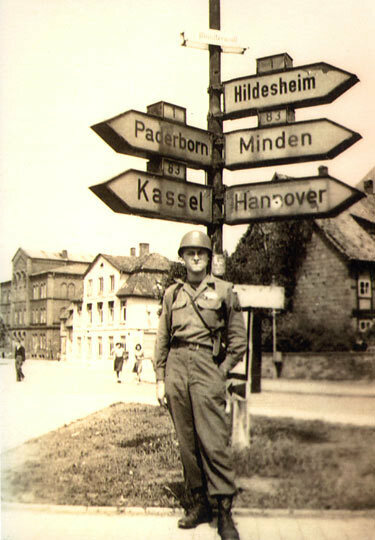 But, when Tott's battalion headed toward the city of Hanover, Germany, in April 1945, members of the 84th were totally unprepared for their next encounter. "There was a road," says concentration camp survivor Ben Sieradzki. "And we saw soldiers. One of them brought out a ... baseball." The barely alive survivors of the Ahlem slave labor camp realized the soldiers must be Americans. "We started screaming, 'Come on up here, come on up here,' and some of them were just bewildered. They didn't know it was a concentration camp," Sieradzki said. Tott, who died in 2005 from cancer, said he and the other soldiers were unaware of the existence of the camps and were shocked at what they saw. "We were witnessing hell on earth," Tott said at an 84th Infantry reunion. "Piles of dead bodies. Men in ragged clothing that were just skin and bones ... Me and the soldiers with me, it made us sick to your stomachs and even cried what we seen there." What the soldiers saw were wraithlike prisoners, some near death lying in their own urine, ravaged by dysentery, typhus and other diseases. A few days before, German guards marched hundreds of able-bodied prisoners to the Bergen-Belsen death camp. They left those too sick, like Sieradzki, to die. Not quite believing what he saw and wanting to share his horrified disbelief with family back in Sioux City, Iowa, Tott pulled out his pocket camera. "Actually, the infantrymen weren't supposed to carry cameras, but a lot of them did, so I got a lot of pictures during the war," he said. After the war, Tott stashed his photographs from Ahlem in a shoebox on a shelf in his basement in Sioux City. He put the war behind him. "I think so many people put away that stuff on a shelf and wanted to forget," said his stepdaughter, Donna Jensen. "I think our whole country's put it on a shelf." Stepson Jon Sadler remembers rummaging through the basement with his friends and sneaking peeks at the photos. "In junior high, we'd open up the box and think, boy, this is terrible," Sadler said. "Look what my dad saw in the war. We just always assumed nobody ... in those pictures [survived]. They looked so horrible and sick." For 50 years, Tott held the same assumption. 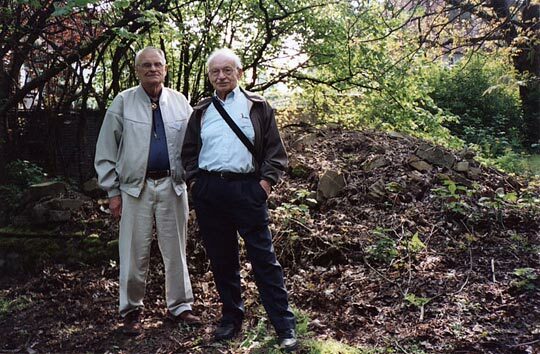 Then, in his army newsletter in 1995, Tott spotted an inquiry from Sieradzki, a retired engineer in Berkeley, Calif. Sieradzki was searching for whoever took photographs of himself and other prisoners when Ahlem was liberated. Tott went into his basement and found his old shoebox. He called Sieradzki, who remembers, "The telephone rang. 'My name is Vernon Tott and I think you're looking for me.' And I said, 'Are you still a tall blonde fellow?' And he said, 'Not any longer.'" The two men talked many times that day. Tott made copies of his black-and-white snapshots and sent them to Sieradzki. In one of the photos, Sieradzki saw dead bodies piled on the ground in front of some barracks. In the foreground, was a huddle of skeletal prisoners. On the extreme left he saw himself. 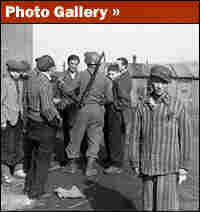 Just hours before that picture was taken, the prisoners were handed some civilian clothes. Sieradzki changed out of his striped, ragged uniform into a "funny looking" jacket, hat and pants, which were too long, so he stuck them in his socks. This is the only known photograph of Sieradzki at liberation. Sieradzki was 18 years old and weighed less than 80 pounds. He had endured more than five years of unimagined misery. It started in 1939, when his family was forced to live in a rundown slum district in Lodz, Poland, with 200,000 other Jews, called the Lodz Ghetto. During this time, Sieradzki's parents and one sister were taken away and killed. His other sister died in the Auschwitz-Birkenau death camp. Sieradzki survived three concentration camps, including Auschwitz, and eventually ended up in the slave labor camp called Ahlem, near Hanover, Germany. Near the end, his worsening health confined him to the barracks. "They called people like me musselmen — goners," he writes in a short story about the war years. "Other prisoners started to steal my ration of food. There was no use to waste food on the likes of me." An older cousin of Sieradzki's arrived as a new prisoner to the camp and urged him to eat. He says his cousin, a man who already lost his wife and young children in the gas chambers at Auschwitz, gave him hope. When Sieradzki saw Tott's pictures of the Ahlem camp 50 years later, he was angry at first. The photographs released a flood of dark memories. But then Sieradzki was grateful, he said, "because I had no record of that horrible time, and here I am." There were other official photographs taken at Ahlem. The Red Cross filmed the camp, but Sieradzki describes Tott as his true witness — and not because he helped liberate the camp. It's for what he did later with his photographs. Tott realized there might be other survivors, like Sieradzki. And perhaps, he could provide them a piece of their past. So, he launched a quest to track them down. Eventually, Tott located nearly 30 Ahlem survivors, across the United States and in Canada, Sweden and Israel. More than 16 are in his photographs. In 2001, he returned to Hanover with three of those survivors to help dedicate a memorial at Ahlem. And he traveled to Poland for the 60th anniversary of the liquidation of the Lodz Ghetto. In 2003, Tott's name was inscribed on a wall of the U.S. Holocaust Memorial Museum in Washington. "To Vernon W. Tott, My Liberator and Hero," Ahlem survivor Jack Tramiel had engraved on the wall. Tramiel, founder of Commodore Computer, is also a founder of the Holocaust Museum. "I have to make sure that this man is going to be remembered for what he has done," Tramiel said. "His family should know that he is to us, a hero. He's my angel." Earlier this year, Tott's hometown, Sioux City, hosted the premiere of a documentary about him, called Angel of Ahlem, produced by the University of Florida's Documentary Institute. More than 1,000 people came to see the film at the historic downtown Orpheum Theatre, including some survivors. They also had the chance to walk through the first public exhibit of Tott's photographs. In May, Angel of Ahlem was shown at New York City's Lincoln Center. Nearly a dozen survivors were there — reunited because of Tott, his pocket camera and his unwavering determination. The documentary was introduced by another member of the 84th Infantry, who helped liberate Ahlem, former Secretary of State Henry Kissinger. 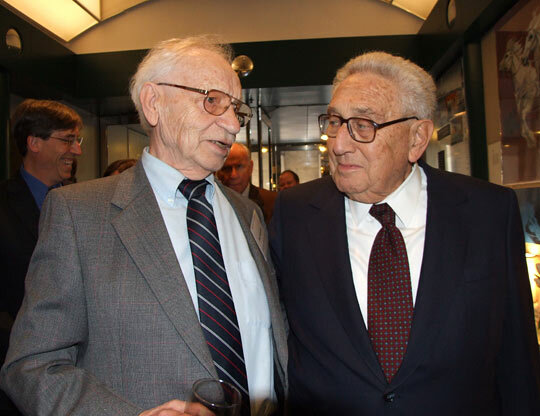 "There's nothing I'm more proud of, of my service to this country than having been one of those who had the honor of liberating the Ahlem concentration camp," Kissinger told the audience. Kissinger grew up in Germany and became a U.S. citizen in 1943. He said many articles have described him as being traumatized during his childhood in Nazi Germany. "That's nonsense," he said, "They were not yet killing people. A traumatic event was to see Ahlem. "It was the single most shocking experience I have ever had." And then Kissinger made a special request. He invited the survivors to come up on the stage and have a picture taken with him. Slowly, deliberately, the white-haired survivors — who'd been brutalized, then rescued from desperate circumstances, so many years before — made their way to the Lincoln Center stage. As they gathered, it was clear that the most important person missing from this one last photograph was Vernon Tott. Story produced by NPR's Cindy Carpien with help from the University of Florida's Documentary Institute, Duane Kraayenbrink and Gretchen Gondek of member station KWIT in Sioux City, Iowa, Brian Bull of Wisconsin Public Radio, and producer Kara Oehler. The music from the documentary Angel of Ahlem, heard in the NPR story, was composed by Todd Boekelheide. Ben Sieradzki was sent to the Auschwitz-Birkenau concentration camp in the summer of 1944. He was 17. Ben and his older sister Anna were loaded onto one of the infamous overcrowded box cars for the journey to Auschwitz. The only possession Sieradzki carried with him was the family album. He held it tightly to his chest until he was forced to drop it after arrival at the camp. The only existing photographs of Sieradzki's parents and two sisters, who died in the Holocaust, are from an uncle who moved to Denmark years earlier. 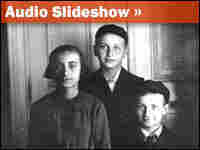 The photographs exist today in a cherished album Sieradzki keeps at his home in Berkeley, Calif.
Sieradzki was born in 1927, the youngest of five children, in the Polish city of Zgierz, a suburb of Lodz. When Sieradzki and his sister Anna were forced to go Auschwitz, they had already lost their parents and other sister, during their time in the Lodz Ghetto. They didn't know what happened to their brothers, who would later survive the war in a Siberian prison. Anna and Ben were separated when they arrived at Auschwitz. Sieradzki remembers marching through the camp complex for the first time. In a story about those years, he wrote, "We could see smoke stacks of the crematoriums with their billowing smoke. One of the guards said, 'These are your folks going up in smoke who just arrived here with you.'" Sieradzki never saw his sister Anna again. He was assigned to a teenage barrack. 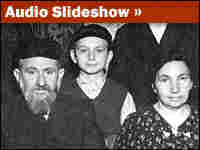 "The barrack held about 1,000 Jewish teenagers from several countries in Europe, but most of them were from the Lodz ghetto. There were no beds and no blankets; we slept on the bare cement floor. We had to lie on one side and could not turn; there was no room to turn." In September 1944, Sieradzki was transported to a work camp near Hanover, Germany, where inmates worked 12-hour shifts in a rubber plant. "After several months of hard labor each day, and the ever-present hunger, cold and abuse to endure, after four and half years of the Lodz ghetto and Auschwitz, we were all tired, denigrated and downcast," he wrote. "A lot of us got sick or injured, and soon after we arrived, people started to die on a daily basis. I saw several people dying during a roll call and after severe beatings." Sieradzki was moved again, this time to the Ahlem slave labor camp, where he was later liberated. "The winter of 1944-45 was very cold and harsh," Sieradzki wrote. "The prisoners in camp were starting to die off in very high numbers, either from diseases, severe beatings, accidents, starvation, exposure, or suicide. We slept two in a bunk, head opposite each other. "The young man who shared my bunk could not get up one morning. I shook him … he was dead. I remember only his last name, Citron, and that his father had a candle factory. The last several days of his life, he would recite poetry in Polish and sing mournful songs. He must have been a very bright young man. We will never know." The guards were extremely cruel. "One of the German guards forced pebbles into a dead man's mouth, proclaiming, 'Here, you Jew-pig, have something to eat!'" Sieradzki wrote. The Ahlem camp was liberated by members of the U.S. 84th Infantry Division on April 10, 1945. A few days earlier, the German guards marched hundreds of able-bodied prisoners to the Bergen-Belsen death camp. They left those too weak behind to die, including Sieradzki. He was suffering from numerous wounds, tuberculosis, typhus, dysentery and severe malnutrition. "At that time, I was just 18 years old, a sick liberated survivor with no ideas about my future," he wrote. "I had no clue as to what kind of person I might become, living in a free society without the perpetual threats to my life and sanity. I had been living like a gazelle in a lion's compound, without any measure of security or comfort." Sieradzki recuperated for several months in Swedish military hospitals. He immigrated to the United States in 1953. He's a retired engineer and lives in Berkeley, Calif., with his wife, Gloria. They have two sons and three granddaughters. The two oldest are named for Ben's sisters who died in the Holocaust.